The Sportage is massively popular. Never have we been asked so regularly for our thoughts on a mainstream new model when out and about. An unusual quirk of this car, however, is that it seems to particularly appeal to those who work at petrol stations; no matter how dark and distant the corner you park it, staff always comment – either to share their approval or to hear our assessment. Whether you like the looks or not, the Sportage definitely ticks the SUV box of 'bold styling'. It’s also been a trusty companion over the six-or-so months we’ve had it; apart from a trip to the dealer to address an annoying electrical bleep every time we locked it, it has not misbehaved or needed us to dig into our pockets for anything. Bar a huge amount of fuel, that is. In that time we’ve clocked up more than 8,000 miles. As we’ve been complaining in many of our reports, in all-wheel drive, automatic, turbocharged petrol form our test car has averaged a mere 31.7mpg – far from the 37.7mpg official figure and a fair representation of what you can expect from this model. And it’s not as if the claimed figure is high; the Sportage has been drinking barely any less fuel than what you’d anticipate from a Mercedes GLC 43 AMG – a car with more than twice the power. Even deep-pocketed families who’d rather a petrol than a less refined diesel and are willing to pay a premium at the pumps, are likely to find that a bitter pill to swallow. Look at the list price and what comes as standard and the Sportage is fantastic value. The good news continues somewhat when you look at Kia’s standard 4.9% APR PCP finance offering with low monthly payments – though this is mainly down to the very affordable list prices rather than the finance deal besting rivals. 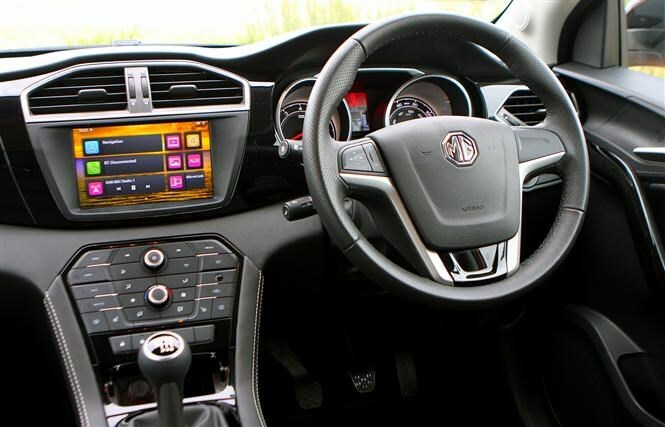 In GT-Line trim our test car includes a 7.0-inch sat-nav system, two-tone leather seats, heated seats for front and outer rear passengers and a reversing camera plus front and rear parking sensors. You also get 19-inch alloy wheels and handy front and rear 12V power sockets, USB and aux inputs for connecting devices to the car and even a temporary spare wheel – a rarity in 2016. In fact, the only option on our car is metallic paint and there’s not really anything that’s missing. Kudos to Kia, too, for throwing so much in when some brands charge you thousands for this kit – especially as you also get a seven-year warranty too. Look around the cabin and you won’t feel short changed, either. 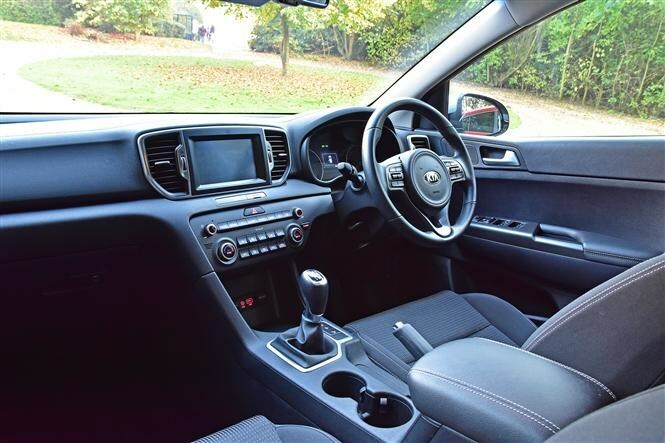 It’s not particularly plush – even compared with its Hyundai Tucson twin, which shares some engines and other underpinnings – but the cabin is comfy enough, offers plenty of room and has reclining rear seats that should keep the gangliest of teenagers happy. The list price stood at £25,655 when we took ownership of our Sportage, but since then it has risen to £25,905. 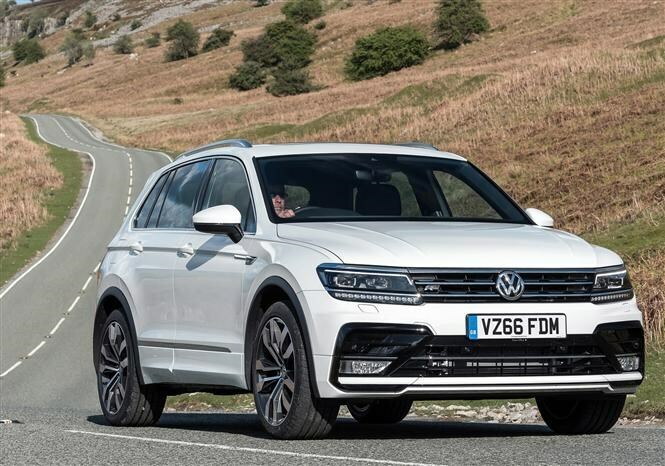 Do bear in mind, however, that it is still top value; to get a similar Volkswagen Tiguan in all-wheel drive, automatic petrol form you’d need a whopping £34,870. Better still, finance costs for the Sportage are now lower than when we picked it up. This is because now the car has been out a few months Kia is offering a £500 deposit contribution – effectively a discount on the list price – meaning that if you signed up today monthly payments would set you back £253.44 (on a 36-month PCP scheme with a £6,400 deposit) compared with £260.91 back in May. 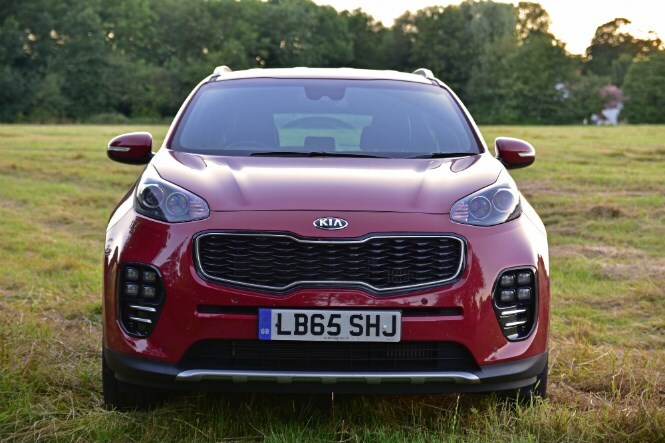 There’s plenty to like about our Kia, but we’ve had our share of niggles, too, most important of which is the petrol Sportage’s insatiable thirst for fuel. 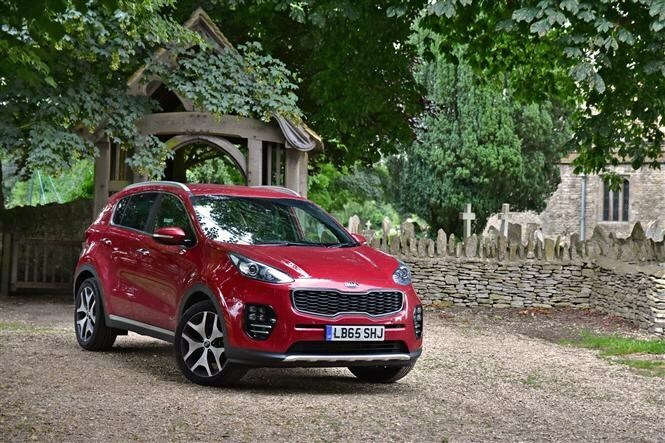 Drive slowly and very carefully and the Sportage can near 40mpg – not bad in isolation for a car of this size and format. However, encounter any traffic or faster roads such as motorways and this figure plummets. We’ve seen several tanks which dipped below 30mpg – entering sports car territory and barely acceptable for this class of car. An average of 31.7mpg overall is also low. 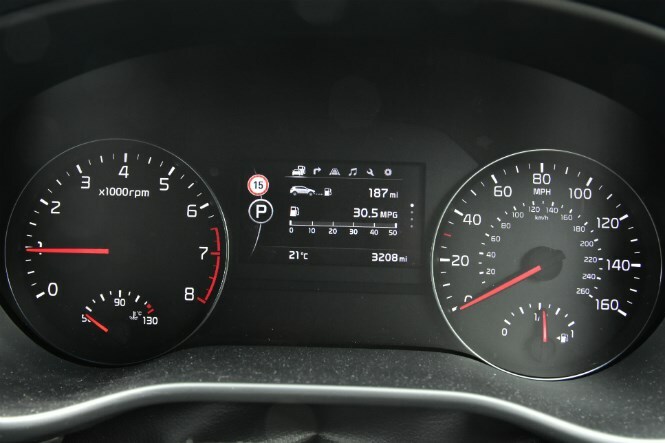 This Sportage is neither fast enough to warrant such wanton fuel consumption nor refined enough to justify the extra fuel cost over a diesel alternative or more frugal petrol rival. In reality, it’s the engine and gearbox combination that is the car’s biggest failing. It may have more than enough power but the motor is coarse and sounds like it’s in pain when accelerating briskly – such is the volume that several passengers though our car was powered by diesel. The gearbox, on the other hand, is dim-witted and incapable of working out what you want – being neither slick enough when dawdling nor responsive enough when overtaking or calling for prompt acceleration. 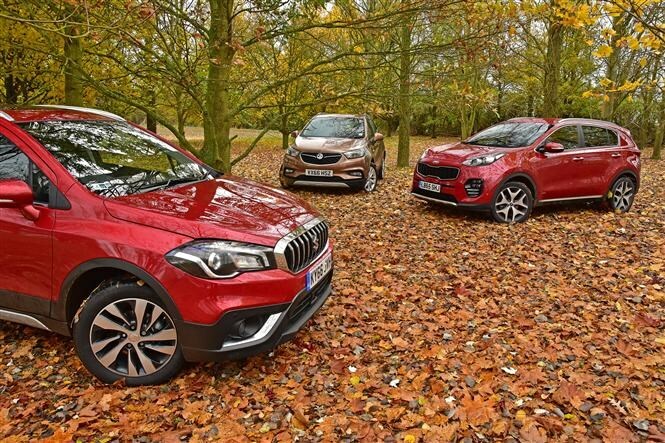 It’s very difficult to crawl along smoothly in traffic – you either have to mash the throttle to get the car to do anything or in Sport mode you kangaroo along with even the smallest foot movement causing the Sportage to shoot forward. Considering most drivers choose automatics for an easier driving experience, this gearbox is not fit for purpose and categorically not worth the £1,300 premium over the manual. You can take manual control with paddles on the wheel, but why pay £1,300 when the manual gearbox lets you do that for free? 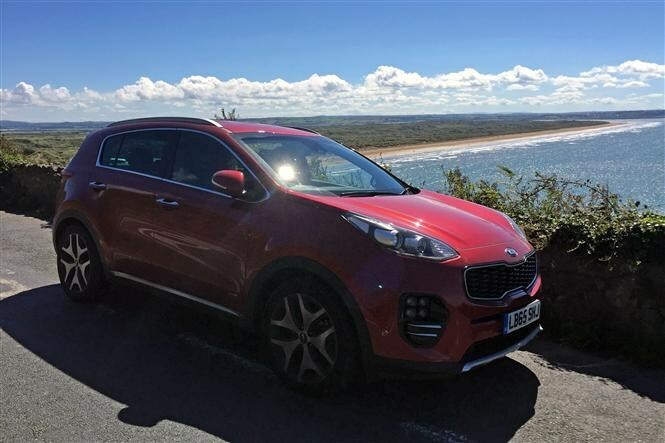 Though many off-roader buyers cite comfort as one of the main appeals of this type of car, the Sportage’s firm suspension and big 19-inch alloy wheels make for a stiff, slightly jarring ride over rough tarmac. In comparison models with 17-inch alloy wheels are much more comfortable while still proving just as adept around corners. The final negative comes in the form of the flawed sat-nav system. Entering addresses is simpler than with many rival systems, which is a plus point, but the device chooses odd routes and isn’t very good at sniffing out the fastest, easiest option. Bizarrely it can suggest diversions to you depending upon traffic, but half the time even the car admits that these detours will take longer than the original route. Kia dealer service has been good. Bar collecting the car, we’ve only had to visit twice to have an annoying bleeping caused when locking the car diagnosed – and subsequently fixed. 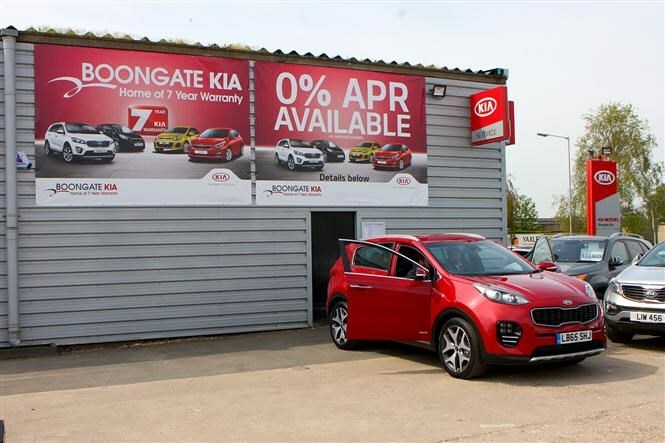 On both occasions dealer Peterborough Boongate was friendly and helpful, though it was a shame that we had to return to the dealer after a week to have a new part fitted, as they didn’t have it in stock. Regardless, this was covered without question under the seven-year warranty, with the Sportage emerging spotless after a wash.
As for wear and tear, there aren’t many signs that this car has chalked up more than 8,000 miles. Inside and outside it still feels fresh and seems like it should put up with family life without incident. Which car would we choose? The Sportage is undoubtedly a bargain family-friendly off-roader that will make many owners very happy. The price, equipment and – admittedly divisive – styling mean you get plenty of bang for your buck. However, it’s very hard to recommend the 1.6 T-GDI DCT petrol automatic as the engine-gearbox combination just doesn’t work well. If you’re going to go for a Sportage, we’d recommend one of the diesels. Even the 116hp 1.7-litre model is sprightly enough for most drivers and if you go for still-well-equipped 2 trim it’s cheaper than our car too – though you don't get an automatic gearbox or all-wheel drive. Better still is the Hyundai Tucson 1.7 CRDI 141hp DCT SE Nav – which weighs in at £25,370. 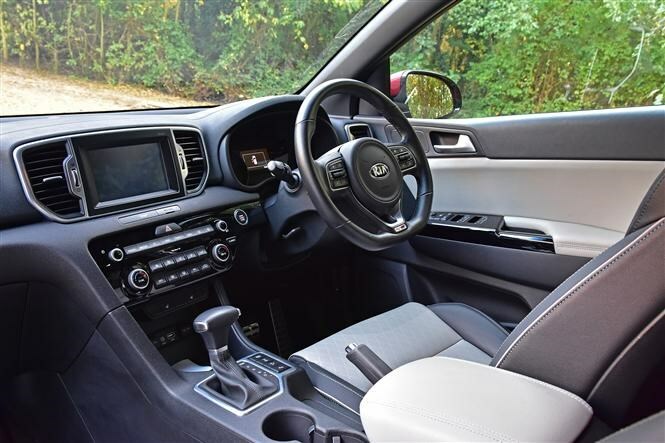 Despite being diesel, this engine overall feels more refined than the Sportage and works much better with the automatic gearbox – being both smoother and quicker to respond when accelerating. If a comfy cabin, big boot and sharp styling were our requirements, however, we’d go for a conventional estate car, as this could get you a bigger boot, much higher fuel economy, more interior space plus extra power and improved roadholding. The Skoda Octavia Estate vRS 2.0 TSI 220 DSG automatic is £3 per month less than an equivalent Sportage and provides a mammoth 590-litre boot that expands to 1,580 litres with the rear seats dropped – compared with 503/1,492 litres for the Kia – making it even more suitable for family duties. Our Sportage has a bit of a drink problem. Short of dawdling around to the extent of holding up other drivers, the Kia munches its way through fuel much faster than we’d like. Claimed economy of 37.7mpg is reasonable, but our average consumption has been steadily going down as we rack up the miles – the opposite of what you’d expect from a relatively new car. Cover 10,000 miles per year and after three years you’ll have spent an additional £736 in fuel with the Sportage compared with the Seat. 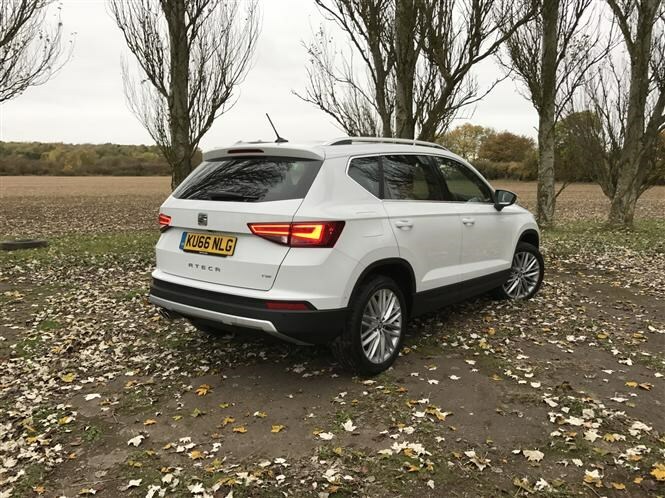 Throw in the Ateca’s lower list price of £23,905, and if you’re happy to sacrifice the automatic gearbox and a little space, the smaller Seat is the more sensible value choice. Choosing a diesel model is another way to shrink you’re fuel bills. Our long-term Mercedes GLC 250 d is returning an average of 39.5mpg to date – enough to save you £894 over three years and 30,000 miles. It may be a much pricier machine, but it’s still proof that a crossover need not cost you so much in fuel. The story gets worse with our last three fills all totalling less than 30mpg – nearing sports car territory. The last tank is our worst of all at a mere 27.6mpg. 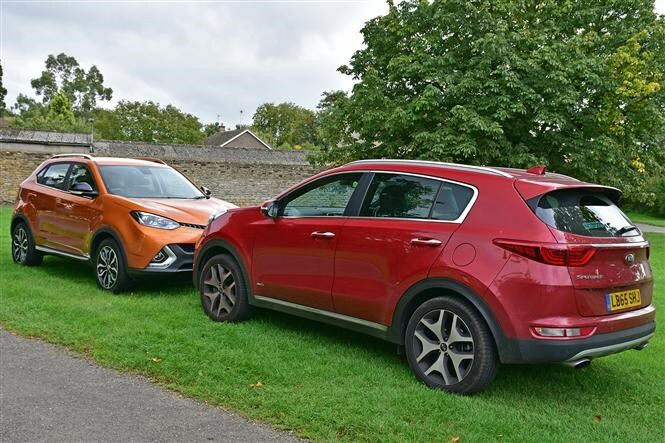 Some of this is down to being stuck in stop-start motorway traffic for several hours – where the Sportage’s lack of a stop-start function really damages its economy – but it’s a rare phenomenon for our car to average more than 33mpg. As a result, the petrol Sportage has reinforced its reputation as a tricky model to recommend. Our Sportage has a bit of a drink problem. Short of dawdling around to the extent of holding up other drivers, the Kia gets through fuel much faster than we’d like. Choosing a diesel model is another way to shrink your fuel bills. Our long-term Mercedes GLC 250 d is returning an average of 39.5mpg to date – enough to save you £894 over three years and 30,000 miles. It may be a much pricier machine, but it’s still proof that a crossover need not cost you so much in fuel. The story gets worse with our last three fills all totalling less than 30mpg – nearing sports car territory. The last tank is our worst of all at a mere 27.6mpg. 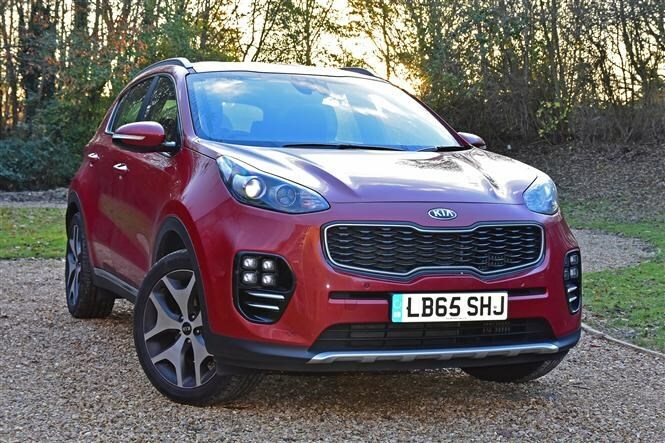 Some of this is down to being stuck in stop-start motorway traffic for several hours – where the Sportage’s lack of an engine cut-out function really damages its economy – but it’s a rare phenomenon for our car to average more than 33mpg. Affordable off-roaders are flying off the shelves, and judging by how many we’ve seen on the roads, the Kia Sportage is one of the models leading the charge. However, it’s not alone. 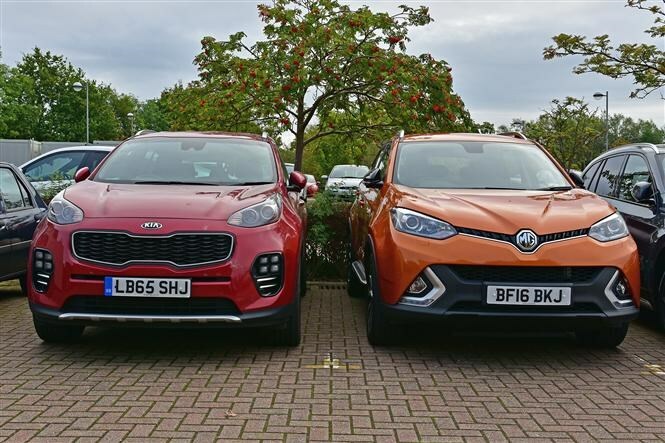 We’ve already compared our GT-Line model with the 1.7-litre diesel-engined Sportage, the MG GS, and its Kia Niro hybrid stablemate. Now we have the chance to compare it to petrol versions of the SEAT Ateca, Toyota RAV4, Audi Q2 and Suzuki SX4 S-Cross. This collection of models may come with a combination of two- and all-wheel drive, and manual and automatic gearboxes, but all feature jacked up suspension, petrol engines and can be financed for £410 per month or less (on a three-year PCP finance contract with a £3,700 deposit). Cheapest of all – admittedly lacking our Sportage’s automatic gearbox and all-wheel drive – is the Ateca Xcellence 1.4 EcoTSI 150PS at just £294 per month*. This compares with £334 per month for our long-term Kia. Despite the low price, the SEAT's engine feels responsive – more so than the Sportage – with a similarly solid but slightly bland interior. It’s also usefully practical, though like the Sportage, it suffers with an overly firm ride. One area where the Ateca scores a slam dunk victory, however, is economy, with our SEAT test car averaging 37.7mpg to date – much better than the 31.8mpg of our Sportage. More than 40mpg is a realistic prospect with relaxed driving, too – a figure the Kia couldn’t dream of and practically identical to what we saw from the much slower 1.7-litre diesel version. Spread costs over four years and £289 per month could get you the keys to the Suzuki SX4 S-Cross SZ5 1.4 Boosterjet AllGrip (with a £3,720 deposit). * The S-Cross may be slightly smaller than the Kia, but it provides the same high-riding SUV feel-good factor and is reasonably practical. It also includes four-wheel drive and feels surprisingly sprightly. Claimed economy even nudges over the 50mpg mark, meaning it should cost you much less in fuel. Up the budget and £353 per month gets you into the automatic Audi Q2 S Line 1.4 TFSI 150PS. 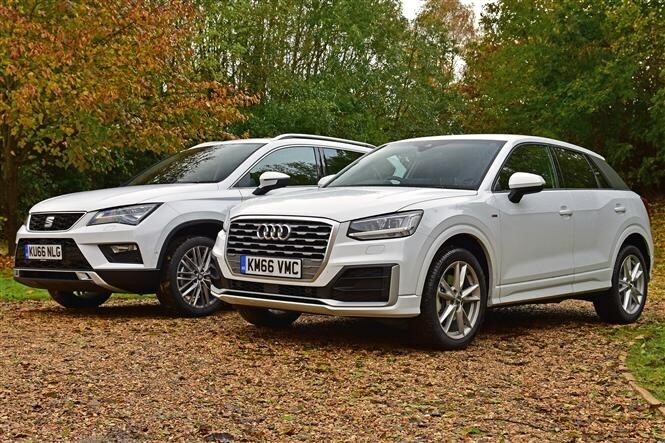 * Sharing its engine with the Ateca, and being smaller in size, the Q2 feels suitably nippy. More importantly, the automatic gearbox is fantastic, proving much slicker than the Sportage when driving slowly and more responsive when upping the pace. Thanks to the smooth, fast-reacting gearbox, piloting the Audi is a very relaxing experience. The engine and gearbox pairing prove that a petrol motor and automatic can work seamlessly in small off-roader. It is expensive, though, with much less space on offer than our Sportage. 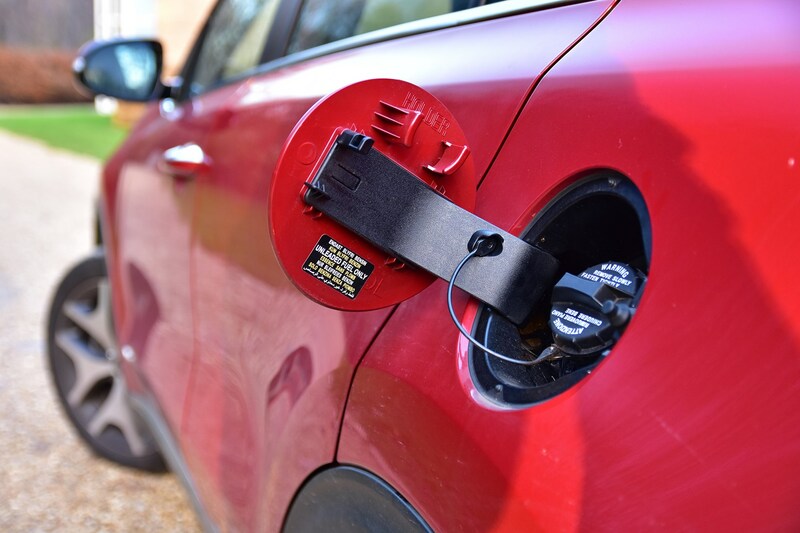 With its hybrid system, the RAV4 boasts a huge on-paper economy advantage with over 55mpg promised. The CVT transmission also proves better at dishing out power from the engine than the Sportage’s automatic. It does feel like a much cheaper car both inside and outside, however, and unless you do a lot of town driving you’re unlikely to see much economy benefit. Which model offers the best value? So where would our money go? The Ateca 1.4 TSI by far offers the best balance between value and space, economy and performance. It manages to be compact on the road but suitably practical for a small family, while boasting striking styling and a solid interior. 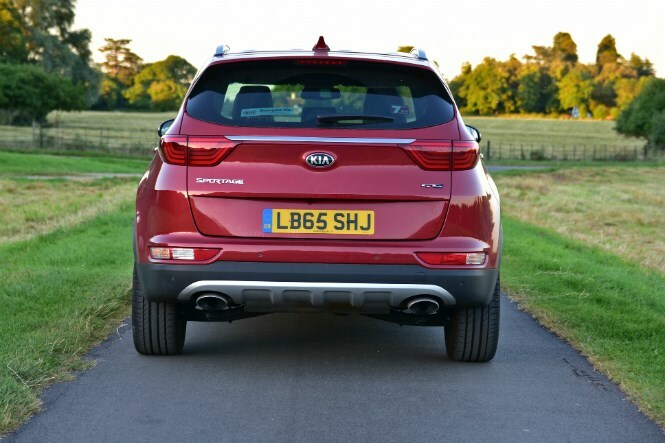 The suspension could be smoother – though this is one of our criticisms of our long-term Sportage, too – and you can’t get an automatic gearbox or all-wheel drive with this engine, so if these are crucial to you, opt for the Kia. Meanwhile, the Q2 and S-Cross suit contrasting buyers. The Q2 packs a punchy engine and a superbly smooth, intuitive automatic gearbox, making it the choice for those who value quality of off-roader over quantity. The S-Cross, on the other hand, features four-wheel drive and feels suitably hardy for venturing off road from time to time. It also drives nicely. Petrol engines may work in some off-roaders, but we still prefer the Sportage in diesel form. Choose the 1.7-litre diesel and you get a comfortable and practical family car that offers strong value. If, however, you must have a petrol, you may want to take a look at the SEAT Ateca. Slating a value-focused model can seem unfair, but our Kia Sportage – despite its low price – just isn’t comfortable or refined enough for a family-focused 4x4. For that you can blame the unnecessarily stiff suspension and oversized alloy wheels. Plus the engine-gearbox combination that either leaves you unwittingly crawling along in a high gear or with the engine screaming away when accelerating. Another side effect of this is poor fuel economy – a mere 31.9mpg during our time with it. We’ve been wondering, therefore, whether opting for a manual diesel Sportage with smaller alloy wheels could solve all of these issues. Go for the lower specification 2 model with Kia’s 114hp 1.7-litre diesel engine and you can save yourself £3,605. On balance, however, this doesn’t sound like that big a saving when you consider that our long-termer has much more power, an automatic gearbox and four-wheel drive – plus sharper GT Line styling. Step up to a 2-specification 134hp diesel – with standard four-wheel drive – and it’s a mere £55 less than our petrol long-term Sportage. Other kit missing from 2 specification (shown in bottom image) includes front parking sensors, heated front and rear seats and two-tone leather seats (see image below). 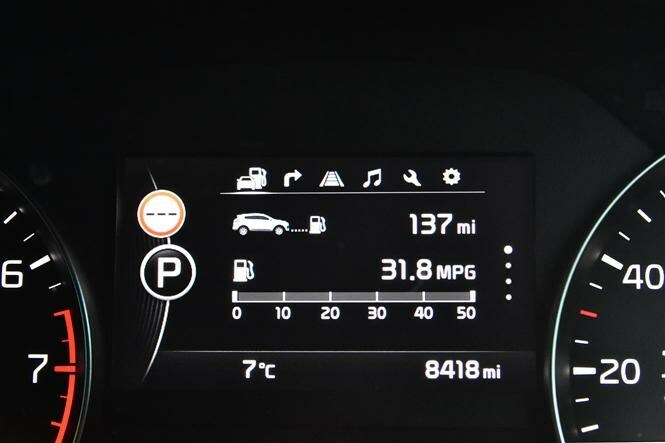 What the 1.7-litre diesel does offer, however, is much better claimed economy; 61.4mpg compared with 37.7mpg. Despite the gulf in power, the diesel feels eager and easy to drive, with plenty of punch from low engine speeds. The manual gearbox means you can easily get the most from the motor and it remains reasonably smooth and refined no matter how hard you work it – though it is a little more gruff than the petrol engine. With smaller alloy wheels and thicker tyre sidewalls, the diesel offers not only a more comfortable ride, but proves surprisingly nimble around bends. The suspension is still a little firm for this class of car, but it’s much better than the GT-Line petrol, though this is a much faster machine. Aside from the lower list price, diesel drivers should save themselves £180 every year in road tax (£30 compared with £210) and spend much less on fuel. 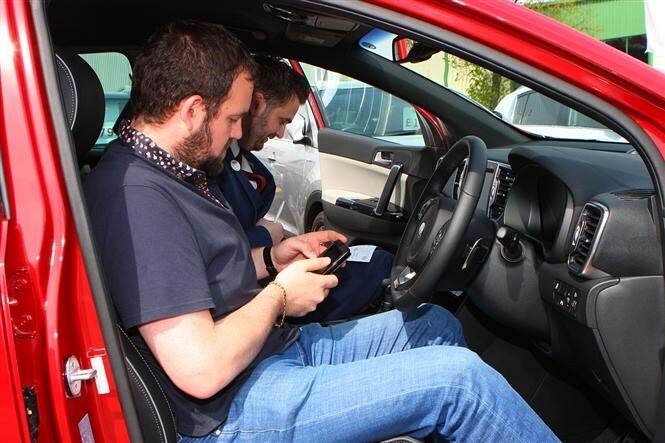 We saw around 45mpg during our test, more than offsetting the slightly higher cost of diesel. As a result, sacrificing a little acceleration and the GT-Line’s bolder styling can get you a car that is much more fit for purpose in the 1.7-litre diesel. The diesel engine may be slightly louder than the petrol around town, but it is by far the better car. If you’re thinking of spending even less and going for the non-turbocharged 1.6-litre engine, however, think again. This engine is thoroughly overwhelmed by the car’s weight, making this £22,300 diesel the sweet spot in the Sportage range. Whether our new long-term Seat Ateca proves even more compelling, however, remains to be seen. We will compare the two cars in our next update. 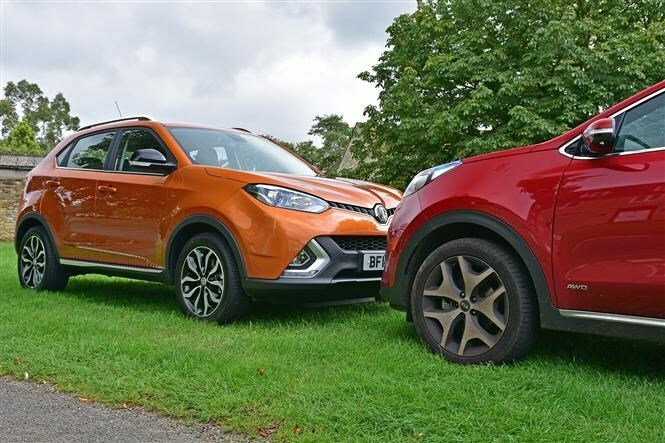 We’ve had the chance to drive our Sportage back-to-back with a less obvious petrol SUV; the MG GS. Despite the Kia boasting an impressively low price of £25,905, the top-spec GS automatic weighs in at a mere £20,995. This despite being the larger car – just – and having a similarly long list of standard kit. Getting behind the wheel of the manual GS we also found it surprisingly enjoyable to drive, answering two of our main criticisms of the Sportage. The steering is well-weighted and direct, making it both more enjoyable and relaxing to drive, and the manual gearbox is slick and easy to use. Though the MG's engine proves just as coarse as the Sportage’s when worked hard, being able to change gear manually makes this a non-issue. This might sound like a slam dunk in the MG’s favour, but not everyone in the Parkers office preferred the GS, with criticism being aimed at its interior and build quality – making it feel like the lesser machine. Despite everything, the Kia still makes much more sense as a cash or finance purchase; though it costs nearly £5,000 more you’re likely to recoup this if you sell it on after three years. 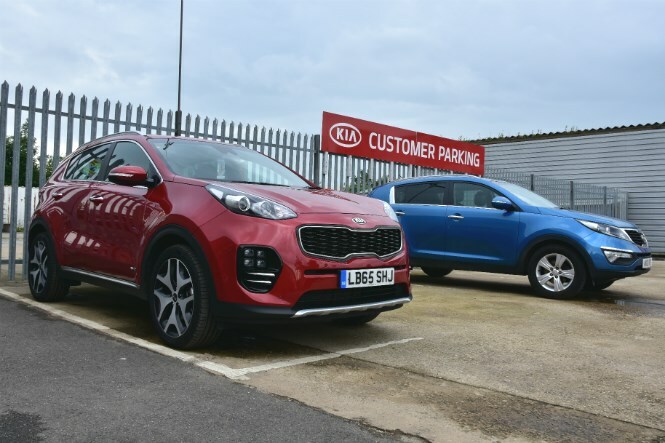 As a result, there’s also just 78p per month difference in the manufacturer PCP finance costs with the Sportage costing £299.78 per month compared with £299 for the GS (both on a three-year contract with a £4,599 deposit)* – and the Kia undoubtedly feels like the more upmarket machine. In less good news, the Sportage’s fuel economy has continued to drop slowly, with the figure falling to 32.0mpg, meaning that trips to the petrol station are more regular and more expensive than we’d like. 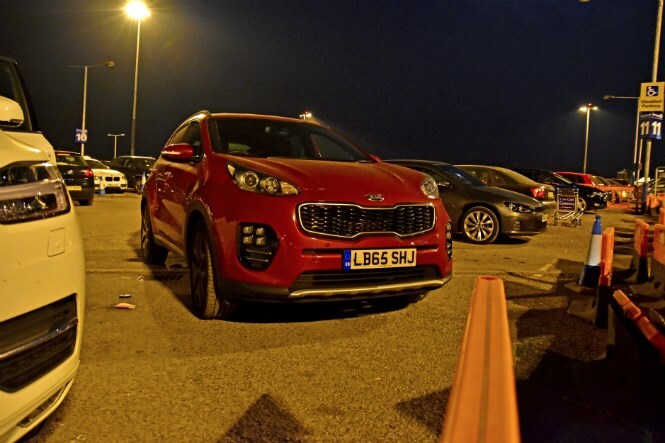 Our Kia Sportage is so nearly a great car. Every time we jump into it, we’re surprised how much car you get for your money – whether you pay cash or opt for Kia’s PCP finance deal. However, it takes a similarly short amount of time for the coarse petrol engine and slow-to-respond automatic gearbox to become irritating. The gearbox requires the finesse of driving a manual to make smooth progress – rather defeating the whole purpose – while several passengers have thought that this car was powered by diesel, such is the din when you work the engine hard. Fuel economy is another bone of contention. The claimed figure is not too bad at 37.7mpg, but our last fill-up saw economy plunge below 30mpg over 350 miles. The stiff ride of our GT-Line model quickly becomes tiring too. After landing in Luton airport late one night last week and heading up the M1 a softer ride would have made the journey more relaxing. If it were our money, we’d opt for a diesel manual model with smaller alloy wheels for a more cushioned ride. Happily, if you do that you can save yourself around £16 per month or £1,355 if you’re paying cash with the 136hp 2.0 CRDi KX-2. Another bonus is much greater fuel economy with a claimed figure of 54.3mpg. While our test Sportage appeals greatly on paper, we imagine a diesel manual model would prove a much more satisfying choice day to day. What is it about crossovers that appeals to so many new car buyers? The raised ride height, the boost in space, a sense of safety? Whatever it is, a recent bank holiday trip to north Devon showed that the crossover revolution shows no sign of relenting. 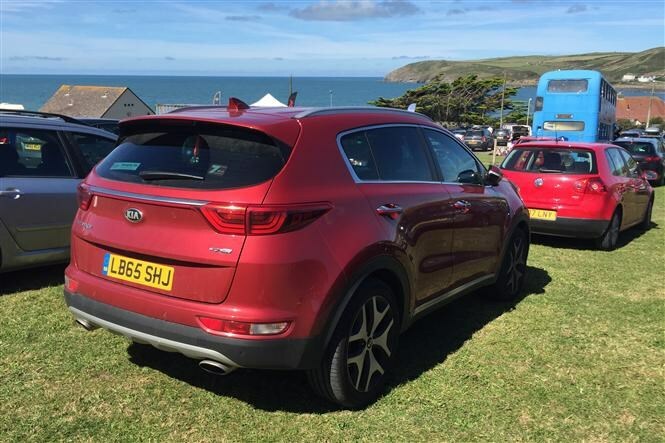 Luckily, swarms of Nissan Qashqais, Volkswagen Tiguans and Audi Q5s loaded up with kids, dogs, luggage and the obligatory roof boxes and/or bikes and surfboards meant our red Sportage could stand out in the crowded car parks of north Devon’s beaches. Its looks might be divisive, but it certainly received plenty of admiring glances from fellow crossover club members. 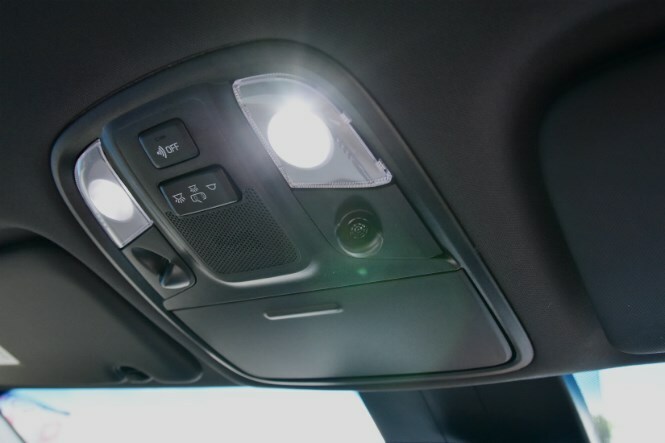 Personally, I think it’s got great proportions and some nice design details like the ice-cube foglights, shallow windows and simple, easy to navigate interior. 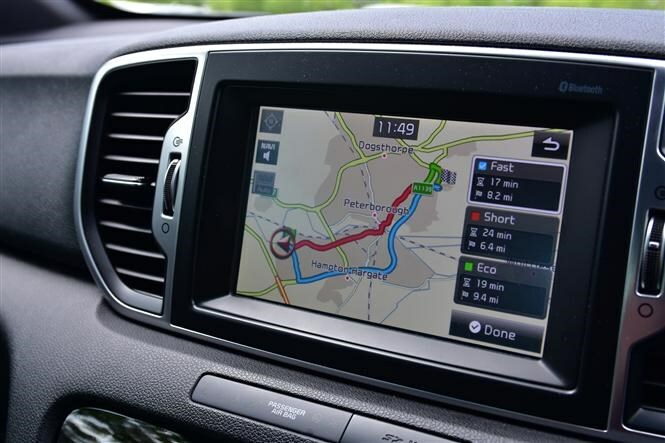 Speaking of navigation, the sat-nav woes previously reported reared their ugly head once more, with journey estimations being way off those suggested by Google Maps when faced with lengthy delays on the 200-mile journey home. The Sportage got the thumbs-up from my family though – namely its interior space, equipment and comfortable ride. The main appeal was sitting up higher and gaining improved visibility and a greater sense of safety in the process. What didn’t impress was the petrol engine and automatic gearbox combination. It was praised for its refinement at cruising speeds, but a series of steep, winding, single-track lanes meant it was put to the test – but the engine proved vocal and the gearbox indecisive and jerky. The raised ride height certainly helped with visibility on these lanes though, while the all-wheel drive system helped the Sportage scrabble up a couple of verges to get out of the way of stubborn tourists not prepared to reverse back to a passing place – the reversing camera on our car played a blinder here too. This was probably as close to off-roading as a car like this will ever get – and a two-wheel drive version probably would have coped just as well – but it’s nice to know it could do it. Back on solid ground the only other chink in the Sportage’s armour is the fuel economy – I averaged no more than 34mpg over around 500 miles. Don’t get me wrong, I appreciate this car’s value and the fact it’s getting very close to its claimed figures, but a family would likely prefer something a bit more frugal than this particular model. 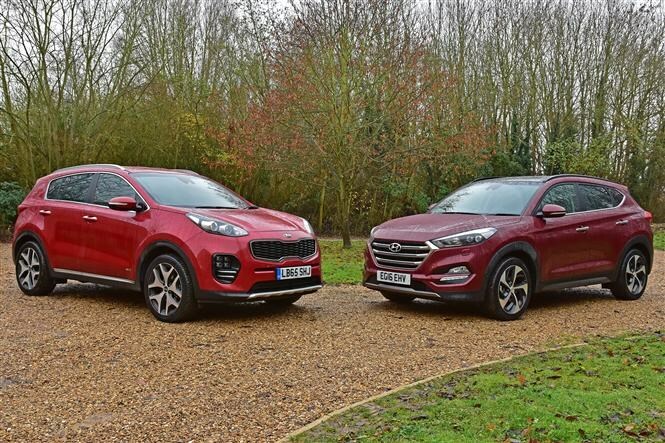 Our test Sportage undoubtedly offers great value compared with its all-wheel drive rivals, but after a few months in our care, cracks are beginning to show in its armour. 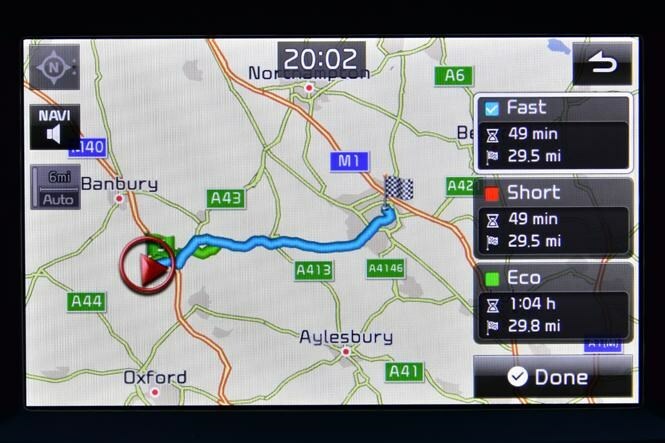 While it’s great to see standard-fit sat-nav, this isn’t the slickest system; onscreen directions aren’t quite as crisp as they could be, while the routes it chooses can be questionable too. Travelling across Oxfordshire on roads I know well a few weeks ago, I tasked the Sportage with finding the fastest route. Rather than take the obvious course, the nav instead took us in completely the opposite direction, on an inexplicably convoluted course. Choosing to ignore it, we looped back onto more familiar roads, to our surprise finding that even the in-dash nav recognised that this way would get us to our destination sooner. Worse than this, the Sportage doesn’t do a great job of adapting to traffic. While it flags up en-route hold-ups, 99 percent of the time the detours it suggests will take longer than the original route – all according to the onscreen ETA. We’re also not sure how accurate that ETA is. With a back-seat passenger firing up their iPad to find an alternative route through Oxfordshire, we noticed up to 10 minutes difference in the estimated arrival time. 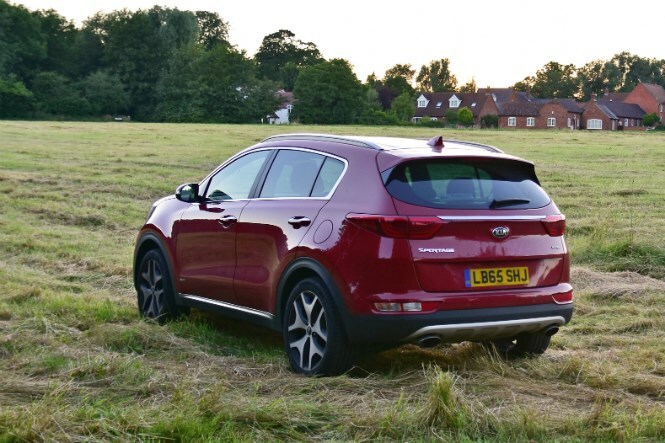 We’ve already established that our test Sportage is extremely good value in the world of petrol off-roaders, but could the toughest competition come from within Kia dealerships? The new Niro hybrid crossover, on paper at least, seems to offer many similarities to our Sportage. Not only does it feature an automatic gearbox and petrol power under the bonnet – albeit with help from an economy-boosting electric motor – but it also features a lengthy equipment list with just as many goodies as the Sportage range. It’s a similar story when you look at the costs. Our top-of-the-range test Niro comes in at a hefty £26,995 – or £297 per month with a £6,400 deposit – though it has several toys our Sportage does without, such as xenon headlights and an electric driver’s seat. Consider the Niro in 3 trim, however, which has a more similar level of kit and you’d be faced with a £244 monthly bill. 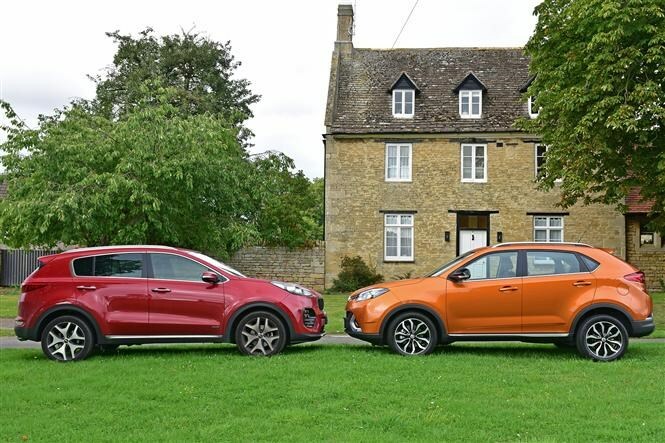 These Niros bookend our Sportage, which would cost you £261 per month (with the same deposit) – giving prospective Kia drivers plenty of options. The differences become more obvious on the road, however. True to its economy billing, the hybrid Niro feels much less responsive to the accelerator than the Sportage. 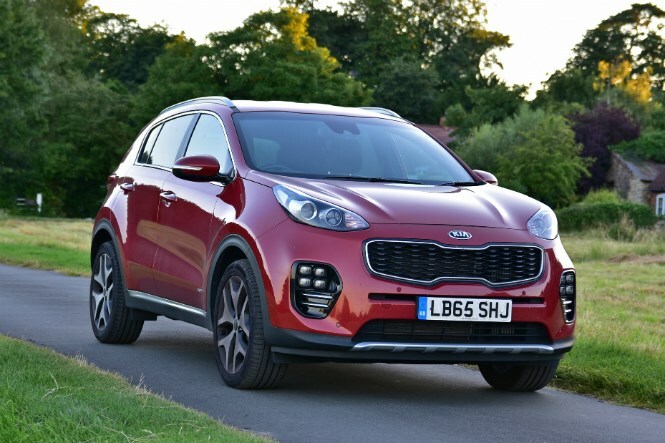 Brisk acceleration requires a heavy stamp on the pedal compared with its sibling – unless you move the gearstick into Sport mode, which makes the throttle response much more sensitive than the Sportage equivalent, making it hard to drive smoothly. Meanwhile gearchanges in this mode transmit a jolt to the cabin, unlike the Sportage. By contrast, it feels much smaller and more nimble around bends, with weightier steering that provides greater confidence than the overly light Sportage wheel. Economy appears to be another area where the Niro takes the lead. 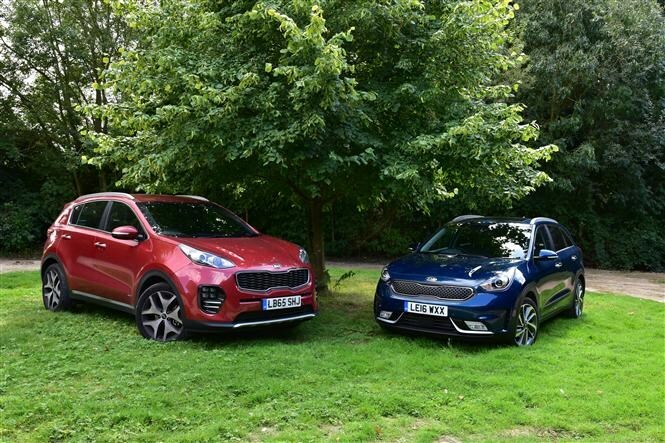 With an official economy figure of 64.2mpg the Niro trounces the Sportage’s 37.7mpg figure, though the difference in reality with dual carriageway driving appeared to be around half that. Road noise also seemed a little higher in the newer car, though this is possible because the petrol-electric combo is quieter when not accelerating than the Sportage’s engine. 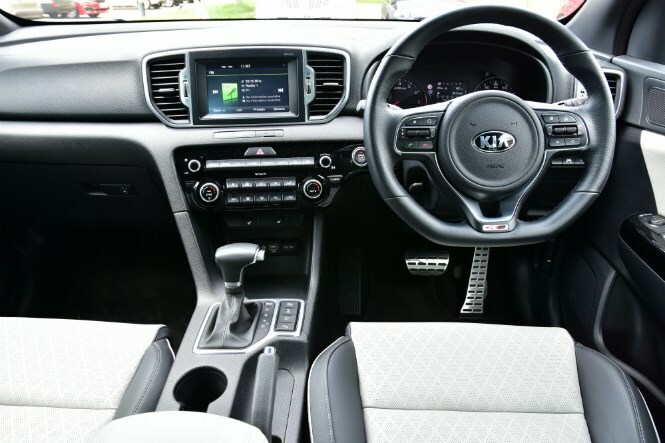 As for the cabin, our test Niro seems more modern, with Kia’s higher-end sat-nav system, which has a much sharper screen. The design is a bit less appealing to me, however, especially in the light colours of this model. 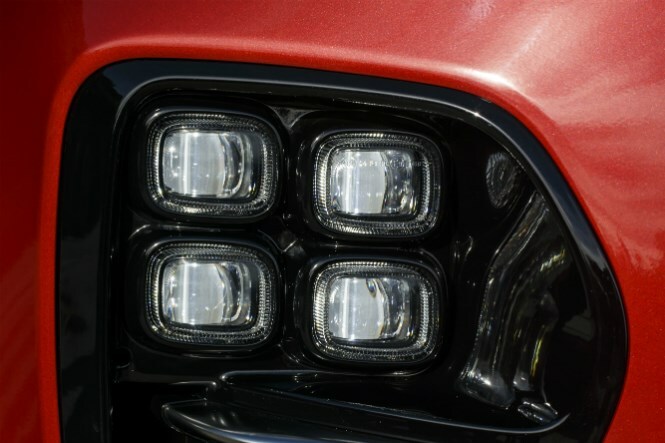 The exterior styling is also… divisive. It lacks the Sportage’s off-roader presence, looking more like an inflated hatchback than a bold off-roader. Which would I choose? 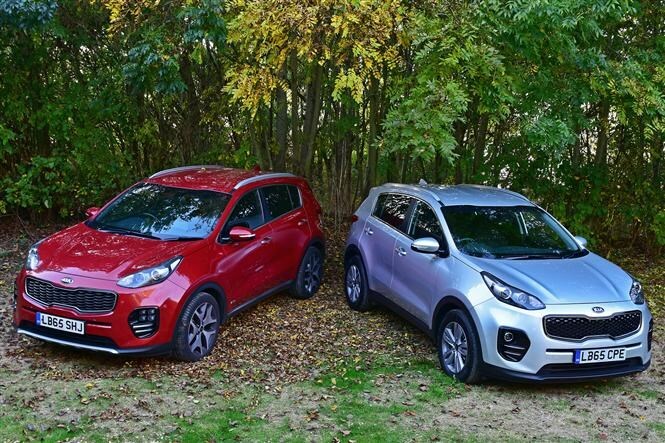 On balance, the Sportage would be my pick. Bar the much worse claimed economy and the less precise steering, the Sportage is a much more appealing proposition. The Niro might be impressive on-paper, offer good comfort and precise handling, but the imperfect hybrid motor and transmission pairing make it a little frustrating to drive. Petrol off-roaders may be something of a rarity due to their higher fuel consumption, but our turbocharged 1.6-litre petrol model not only makes sense against rivals but against diesel Sportage alternatives too. Again, the key is the price. 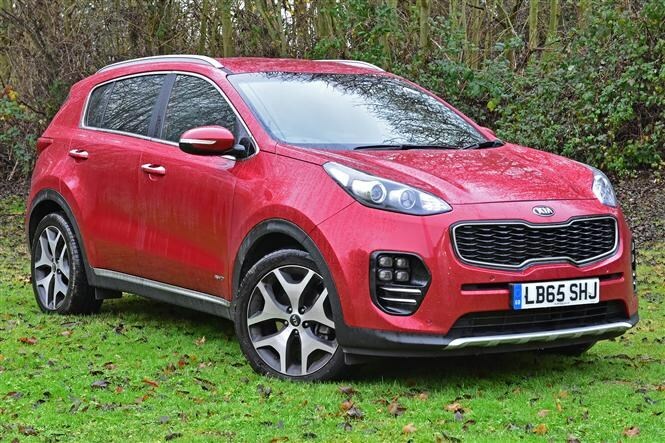 Surprisingly, you can’t get the most powerful diesel Sportage in style-focused GT-Line trim, though even the much slower 136hp diesel GT-Line automatic is an additional £1,510. Opt for the cheapest version of the automatic 185hp diesel and you’ll need a whopping £5,060 more than our car costs. You may think that you’ll quickly make that up in the diesel’s greater fuel economy and lower road tax. However, that’s not the case – whether you buy the car outright or opt for PCP finance. 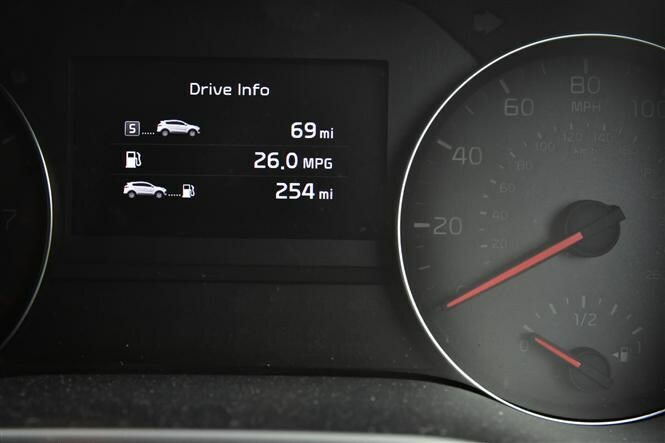 Fuel consumption from our 1.6-litre petrol Sportage stands at an official figure of 37.7mpg – though we’ve achieved an average of 32.7mpg to date. While the diesels are a little higher at 47.9mpg and 44.8mpg for the 136 and 185hp models respectively, even if you take into account fuel and road tax costs, the petrol is the cheapest to run. Helping its cause, our test car costs a meagre £260.91 per month with Kia’s PCP finance deal (assuming a £6,400 deposit). Put down the same deposit and you’ll need to stump up an additional £45.69 every month for the 136hp diesel, with the 185hp model costing an enormous £107.41 extra. Consequently, even the less powerful diesel will set you back an additional £700 over three years and 30,000 miles, once you account for monthly payments, fuel bills and road tax – whether you hand the cars back at the end of the contract or make the optional final payment to buy them. The 185hp diesel, meanwhile, will cost well over £3,000 more than the petrol. In our last update we criticised the easily confused gearbox and the engine, which becomes surprisingly noisy when accelerating hard. However, when you bear in mind just how much cheaper our test car is than diesel Sportage models – along with petrol rivals – this seems a relatively small price to pay. We also mentioned that Sport mode makes the transmission more responsive, while the steering gains some welcome extra precision. Furthermore, the ride seems a little smoother since we checked the tyre pressures – in this case taking some air out of the tyres. It still should be a little softer over rough tarmac considering its high-riding ‘off-roader’ billing, though most of the blame can likely be levelled at the large, low-profile 19-inch wheels. If your heart is set on the turbocharged petrol Sportage, though, this is your only option, as GT-Line is the sole specification available. If you’re not bothered by the firm suspension and imperfect engine and transmission combo, though, the Sportage seems to be in a class of one. Even the looks are growing on us, though the bold front is still very much an acquired taste. 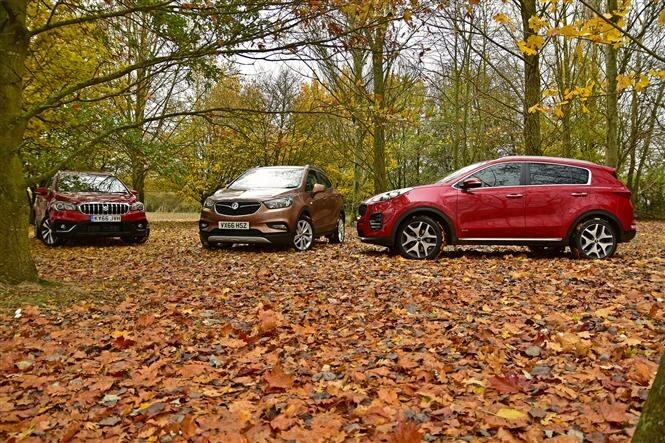 No one buys an automatic, petrol, four-wheel drive off-roader to save money, but having totted up just how much rivals would set you back, the Sportage really is something of a bargain. Admittedly, not many brands sell gas-guzzling all-wheel drive petrol crossovers with a self-shifting gearbox, but compared with the ones that do, our car looks like the best value model on the market. Having taken custody of the Sportage from my colleague Gareth, I was curious to see how well suited the petrol and automatic combo was in such a large car – and whether it would prove ruinous in fuel bills. The list price for our well-equipped Sportage 1.6 T-GDI GT-Line DCT weighs in at £25,655 – with no options adding to that, bar the £545 metallic paint. Search for a similarly sized four-wheel drive, automatic model and you’ll need to find an additional £1,655 for the keys to a Ford Kuga 1.5T Titanium – and even then it can’t match the Kia for performance. Look for an upmarket alternative and it would take an enormous £8,810 extra for an equivalent VW Tiguan, with the BMW X1 at £6,855 more and the Mercedes GLA250 £7,490 extra. 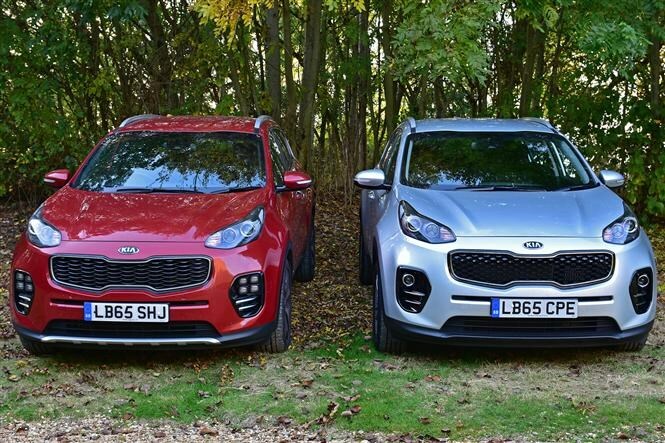 Admittedly, these German models offer much greater performance than the Kia, but the Sportage should prove more than fast enough for most drivers. Yes, the Kia’s standard-fit four-wheel drive dents claimed economy by a substantial 10mpg or so compared with the best two-wheel drive rivals – and BMW and Mercedes' four-wheel drive rivals – but the Kia’s sheer value for money is undeniable. 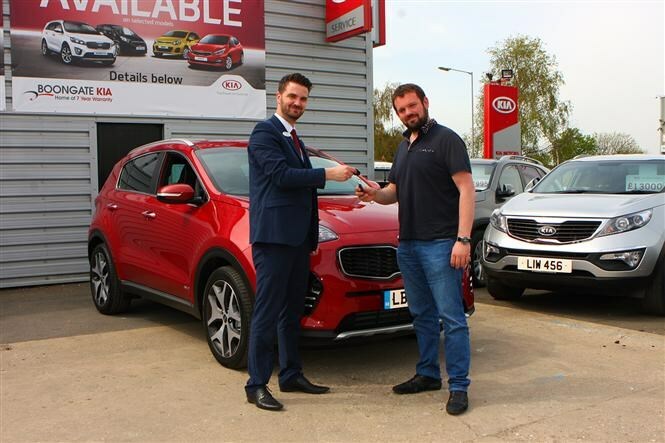 To date our Sportage seems to be averaging around 33mpg with mixed driving, which means that we’re filling up more often than we’d like – especially bearing in mind the official 37.7mpg figure. However, 150 miles of very careful driving saw us return 38.3mpg – so the car is undoubtedly capable of beating our current average. 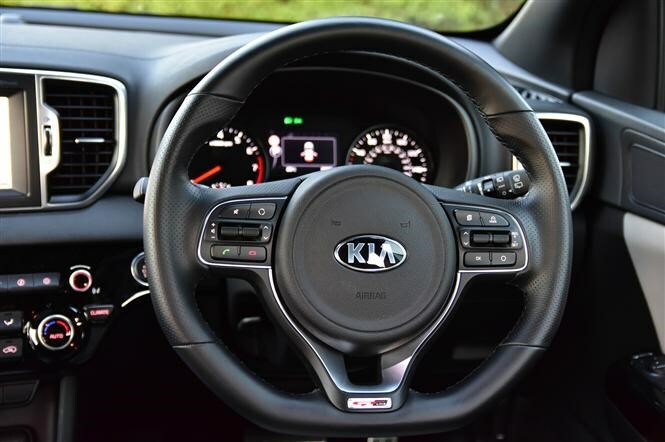 With large 19-inch alloy wheels, a bold stance and its Sportage name, our Kia presents itself as a more of a driver’s car than a farmer’s four-by-four. The engine provides a reasonable amount of power, though you have to mash the throttle – encouraging the gearbox to change down a gear or two – for any meaningful acceleration. The steering, meanwhile, is somewhat vague at speed, meaning that you have to constantly shuffle the wheel to maintain your course on the motorway. Switch to Sport mode and the Sportage is a much easier, more satisfying machine to drive. The steering gains extra weight and seems to hold its course better, while the gearbox treads a better line between using high gears for economy and changing down when you need to accelerate. The big alloy wheels add a little firmness to the ride quality, though this is still a reasonably comfortable machine. It’s also pretty quiet when cruising, with little engine or road noise. Drive the car harder, though, and the gearbox can be slow to shift down through the gears and the engine quickly becomes raucous. Thankfully, this isn’t often necessary as the motor provides plenty of punch from low engine speeds. Just a few weeks into Sportage ownership and the car started issuing a mechanical beep every time we locked it. Perplexed, we returned to the main franchised dealer in Peterborough, Boongate, to get the problem diagnosed. After investigation by Kia technicians, we were told that the car needed a new ‘room lamp’, as it thought that someone was locked inside. Without this part at the garage, Boongate promised to order one in. A week later we returned to drop off the car and the next day we received a call to inform us that it was ready for collection. Arriving back in the car park our Sportage had been treated to a wash, with its bleeping habit now cured. 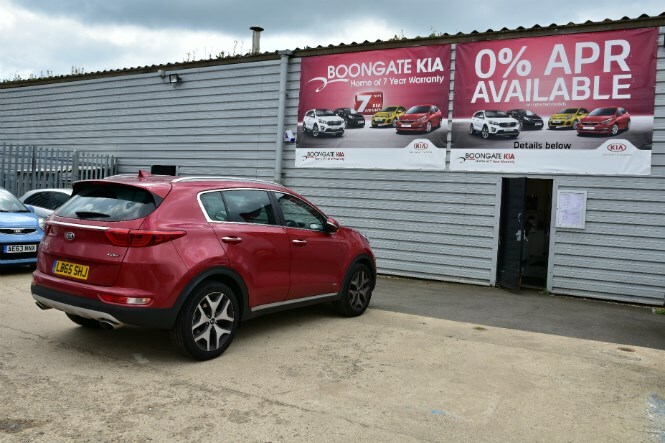 Settling on a 1.6-litre T-GDI petrol Kia Sportage with a DCT automatic gearbox in GT-Line specification, our call came one Thursday morning and so off we went to Boongate Kia in Peterborough to experience the Korean firm’s handover process. Arriving at the medium-sized garage on an industrial estate, we were met by friendly assistant sales manager Tony Meads, who immediately took us into his office to discuss the details of our new acquisition. Though we’d already crunched the numbers and made our peace with the financial aspects of the arrangement, Tony went to great lengths to explain in detail what each thing meant. 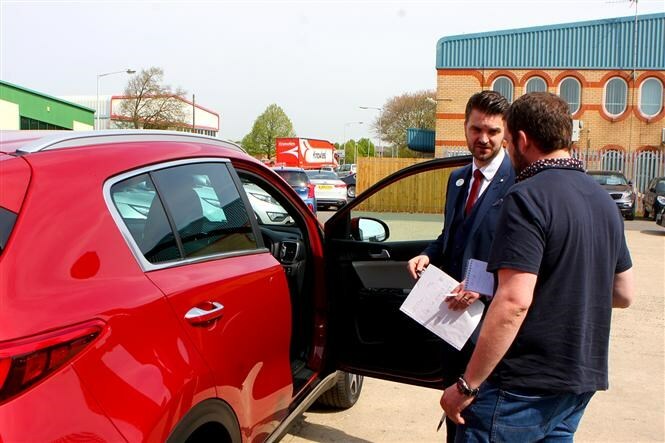 We spoke about the Kia Care service plan, costing £329 for three services if you’re doing fewer than 10,000 miles per year. That seemed like a good deal to us, but when Tony told us a little haggling often sees it thrown in for free with PCP deals, it looked better than ever. What’s included in Kia’s warranty? 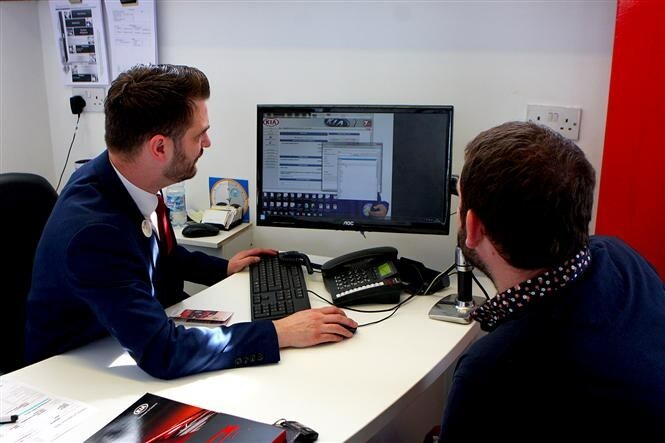 One thing many sceptical prospective Kia customers – us included – want to know about is the warranty. It’s an industry-leading seven-year, fully transferrable arrangement that frankly sounds too good to be true. Next up it was time to talk about the PCP deal on the table. Around 76 percent of Sportage drivers do so on a Personal Contract Plan, and typically they walk into the dealership with a 10 percent deposit. 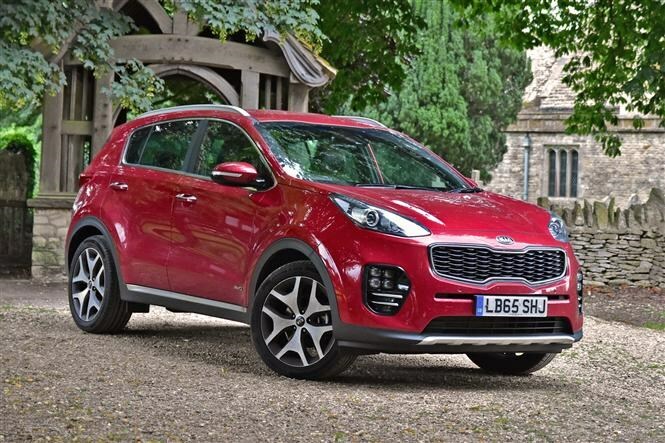 That meant our £25,655 Sportage would cost £353.37 per month assuming a £2,500 deposit, fixed APR of 4.9 percent and assuming a three-year PCP covering a maximum of 12,500 miles per year. At the end of the agreed period, a £13,180.50 payment would buy us the car outright, at which point the remaining four years’ warranty would still be applicable. How much cheaper? Tony crunches some numbers for us on a conditional sale arrangement and immediately the difference is obvious. It would cost us £708 per month over the same three-year deal, and extending to 60 months brought payments down to £400. Incidentally, it doesn’t help that the APR on the arrangement has to rise to 8.9 percent; the lower 4.9 percent fixed rate is only available over three-year arrangements. Clearly the PCP offers the best package here. We were also given another business card, meaning along with Tony we had another point of contact at the dealer. It’s all positioned to give extra peace of mind for customers. Heading outside into the sunshine we saw our Sportage for the first time. It was absolutely immaculate, as you’d expect, its new paintwork gleaming and interior emitting that unmistakable new car smell. Tony proceeded to officially hand the car over to me. Starting with the keyless ignition, he took me through all of the basic functions of the car. He explained that we’d know it’s locked because the mirrors will fold in, and that it’s impossible to lock the key in the car by mistake. Next it was time to pair our smartphone to the multimedia system. This took seconds, and then Tony went through all of the stereo, sat-nav and climate control functions on board. This GT-Line car really does have some impressive features, which we’ll guide you through at a later date. Finally, with a quick explanation about how the gearbox operates, we shook Tony’s hand and took our brand new set of keys. We slotted the gearlever into the D position and motored off into the midday sun. The entire process lasted around an hour, but could be as much as two if you’ve got lots of questions. Either way, Tony was patient, well-informed and convivial. He called a few days later just to check all was OK with the car, which was another nice touch. Nothing had gone wrong, of course, but it left us feeling we could call the garage at any time if anything went wrong. Let’s just hope we don’t have to.